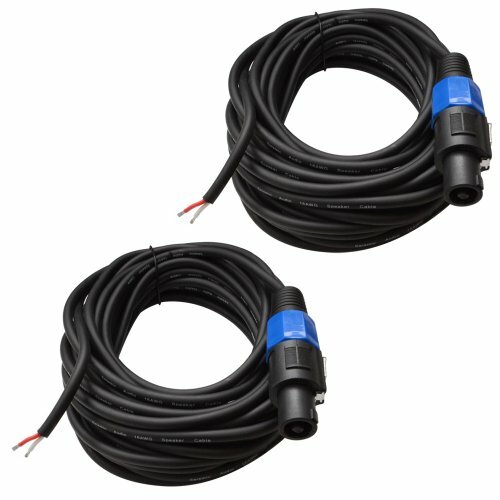 Pair of Raw Wire to Speakon Connector Pro Audio Speaker Cables - 50 Foot Model #: SPRW50 (Pair) Raw Wire on one end Speakon connector on the opposite end 16 Gauge Wire PVC Wrapped Shielded Color: Black Length: 50 Feet Home Speaker Use Connect Speakers that have Speakon connections to Home Audio gear Perfect for amps, receivers, or speakers that have the red/black raw wire tabs and need to be connected to a device that has Speakon connectors Condition: NEW One Year WarrantyWhether you have a permanent installation or mobile, Seismic Audio's Raw Speaker Cables are rugged enough to handle whatever you throw at them - road ready and built to last. The quality of the cables you use to connect your sound equipment is critical if you are looking for an accurate music and sound reproduction. These cables are ideal for those that have speakers with Speakon connectors and want to connect their speakers to an amplifier or home receiver that has the black and red raw wire tabs. The Seismic Audio brand was designed to make the professional musician, as well as the musician low on cash, sound great. Ideal for Speakers that have the Speakon connector and are being connected to receivers or amps that have the raw wires (red and black tabs).